Motorcycle insurance is as personal a choice as your choice of bike. The right motorcycle insurance, like the coverage that Allstate provides for riders, is top notch and designed just for you and your bike. You can’t always get this level of coverage as part of your standard motorcycle insurance policy. But with Allstat, you do. 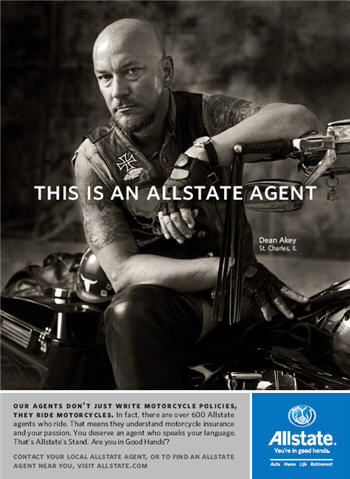 So when you choose your motorcycle insurance coverage from Allstate, you’ll get a policy based on your bike and lifestyle, making it easier to find the package that’s right for you. And you’ll work with reps who really know your bike if you have a claim. In short, you have an insurance company that doesn’t just appreciate your passion; they share it. In fact, go ahead and click for a quote – it isn’t going to take ten minutes, and we know that you’ll be surprised at how good the rates are. Cruising on the open roads means independence and freedom. Whether you use your motorcycle to tour the countryside or to navigate through city streets, Allstate will make sure it’s revved up and ready to go with the right coverage. We offer competitive rates for touring, cruising and standard model bikes. Enjoy the open road with confidence knowing you have Good Hands® protection.